It's no secret that confidence is the key that unlocks all of life. It's the one trait that allows you to improvise and handle any situation effectively. There's no way around the fact that we live in an extrovert driven society which basically means that the more talkative and confident you are the better you'll do in life. With enough confidence, you can land your dream job or get a girlfriend. The entire world becomes your playground and nothing is out of reach. But how do you actually build true sustainable confidence? How do you become the man that you were destined to be? 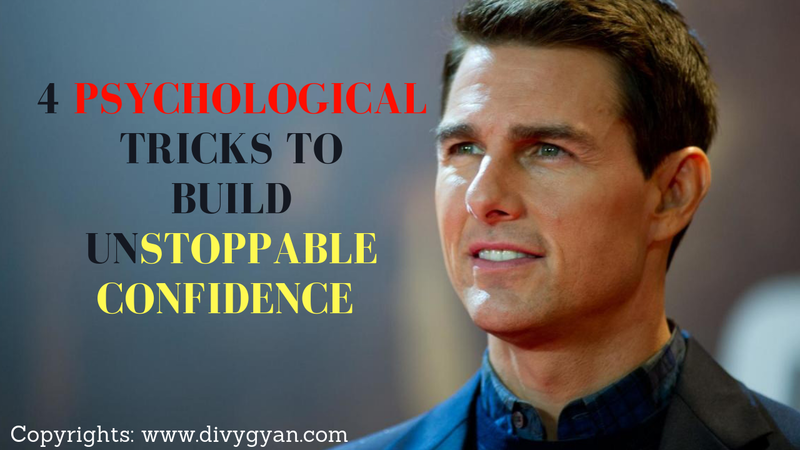 You're about to learn for psychological tricks that will help you to build authentic confidence and become the man that you've always wanted to be. In other articles, I have always talked about turning difficult challenges into a game and I do it this way simply because it works. Whenever you're trying to build confidence and anything turn it into a learning experience. Imagine you're trying to get better at communicating with girls. So many guys make the mistake of trying to get better in something and when they fail they take it personally. I remember when I was younger and trying to learn how to do a kickflip there was a point where I had tried so many times that I thought I would never get it. I thought I'd never be good at skateboarding and I took my failure of not being able to kickflip personal. The next day I woke up and turned it into a game to see how many times I'd have to do it before I finally landed the trick. That night I landed my first kickflip and I still remembered that euphoric rush I got. The moment my feet landed on the board after hundreds of failed attempts. No matter what it is you're trying to do confidence is built through learning and not taking failure personally. Tip number #2: Is the small win. Many of the greatest athletes in the world used this trick to build confidence in their chosen sport. It is so important to have big goals but they aren't useful in the short term. Anything that you want to build confidence is nothing more than a huge number of small wins and with each additional wind that you gain you gain a little bit of confidence. From one wind to the next you won't notice much of a difference but over time as you gain more and more winds you'll say to yourself wow I'm really getting good at this. Later on, as all of your small winds start to add up. Eventually, you'll accomplish your big long-term goals and that will come a point in your journey where you will truly start to feel unstoppable. Building confidence is like anything else in life and it Oh basil law of momentum. As you accomplish more wins and gain more confidence the results start to build on themselves and before you know it you'll feel like a giant, unstoppable, Boulder of confidence rolling down a hill. Tip number #3: Fake it until you make it. One of the most powerful scientifically proven techniques for building genuine lasting confidence is to quite literally fake it until you make it. But what does that really mean in life? Often times it's the simplest advice that has the most profound effect on your results and this tip is a great example. To start building confidence simply act as if you're already the confident person that you want to become. This means doing things like speaking up for yourself. Speaking your opinion and not being afraid to offend people or cause others to not like you. Science tells us that there is no limit or cutoff age for rewiring our brain and thanks to neuroplasticity you can rewire your brain and build confidence in any activity at any age. When you fake confidence you take a risk. Sure the situation might not turn out the way you want but each time that you fake confidence and it does work out you'll gain a small win. Tip number #4: And the final tip today is "Embracing conflict"
The heart of what it really means to be a man is embracing conflict and challenges in your own life. Think about that guy in the crowd who isn't afraid to speak his mind. Sure he might offend some people and he might even offend you but deep down when everything has said it done you can feel his dominant energy. Embracing conflict is a core psychological trick to gaining confidence in anything. On your journey embracing conflict will cause you to be disliked, rejected, and shunned by many. But at the end of the day even those who have rejected you will respect you. They will respect the fact that you had the guts to speak your mind and take conflict head-on. All the nice guys will wish that they had a spine as strong as yours. If you don't land a kickflip after the first 500 tries, embrace the conflict by these failures and keep going. Keep fighting every challenge when you fail and end up looking stupid while doing anything learn from it. Don't take it personally and accept the next challenge and don't ever let anyone tell you that you can't do something in life. Tags : "confidence" "confident" "how to be confident" "how to be more confident" "motivation" "motivational" "personal development" "self confidence" "self esteem" "success"